For refugees wishing to enter UK Higher Education, it can be a challenge to know how and where to begin. There are many practical questions such as how to apply; how to finance your studies; how to provide evidence of your previous studies and, of course, how to provide evidence of an adequate level of English. A very useful website to use as a starting point is Refugee Study. This website contains lots of practical information about scholarships and grants as well as advice about how to obtain funding for study and links to website listing recognised qualifications obtained overseas. Many of the questions that refugees have are also addressed in the open and free online course (MOOC): Aim Higher: Access to Higher Education for Refugees and Asylum Seekers. Student participants can create an account and select ‘register interest’ to receive information by email about the next running of this MOOC. Inside IELTS – the next course starts on 8th January or students can register their interest in taking a later course. 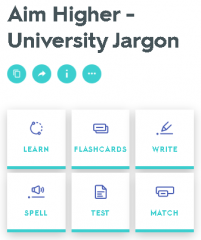 There is a lot of jargon around the process of applying to university but a useful resource that explains some important terms has been created by the Aim Higher MOOC team: Aim Higher University Jargon. Finally, there is of course the Prepare for Success website and its range of learning resources dealing with the academic skills and language needed, and practical aspects of study in higher education in the UK. I also had to learn to write in different formats for essays and reports. I can still recall the first piece of work I completed, which was an essay. I thought it was good as I used headings, subheadings, and bullet points as clear signposts. However, I was shocked to only get a mere pass of 40%. I realised I had used the wrong format, and referring to the mark, I was shocked because in China, 60% is a pass, and students would normally achieve 80% or 90%. However, it appears that achieving 80% or 90% is quite rare in English universities, and getting 60% or 70% is regarded as a high mark. Critical evaluation was another key new concept I had to learn in the UK. In China, we used to believe in whatever was published and regarded it as the authority. However, after coming to study in the UK, I learnt to think and write critically, where I had to look into different facets of an issue and ask questions like a detective. I had to synthesis various views from different scholars, analyse and critically evaluate them before presenting my own ‘informed’ opinion. This method of critical evaluation is not easy for an international student because It not only requires critical thinking, but also extensive reading from academic, reliable and credible sources, as well as writing skills such as paraphrasing and synthesising. In addition, I learnt to manage my time and to study independently which are vital skills because students do not necessarily have classes every day. It’s all too easy to waste time by watching movies, social networking or playing computer games! This was particularly important when I was doing my PhD research as, apart from only a few one-to-one supervisions with my supervisor, there was not any compulsory class to attend. A lot of assessments in the UK also involve group-work and managing teams can be challenging. I found working with others from different cultures could be challenging, but gradually I learnt that this experience was very valuable for my professional life, and my English language development. In all, my own experience shows that academic expectations in the Chinese education system are very different from those in the UK. It is very important for Chinese international students to know what to expect beforehand so that they can fully prepare themselves for their study in the UK. This is why I co-authored our book Study Skills for Chinese Students because I know that such a book would really have helped me so much when I first came to study in the UK. I want to make sure that all Chinese students in the UK have this essential information now, about the differences and challenges of UK study, and the academic skills and techniques expected in the UK. If you have a question related to academic life and study in the UK and you can’t find the answer in the Prepare for Success learning resources, write it on the Question Wall and we will try to answer it here in the blog next time.If you have a question related to academic life and study in the UK and you can’t find the answer in the Prepare for Success learning resources, write it on the Question Wall and we will try to answer it here in the blog next time.